The diagram illustrates the brightness of a supernova event relative to the sun as the supernova unfolds over time. For the first time, a supernova shock wave, or shock breakout, has been observed in visible light wavelengths as it reached the surface of the star from deep within the star's core. The explosive death of this star, called KSN 2011d, reached its maximum brightness in about 14 days. The shock breakout itself lasted only about 20 minutes (see inset). NASA's planet hunter, the Kepler space telescope, has captured the brilliant flash of an exploding star's shock wave--what astronomers call the "shock breakout" of a supernova--for the first time in visible light wavelengths. An international science team, including two astronomers from the University of Maryland, analyzed light captured by Kepler every 30 minutes over a three-year period, searching some 50 trillion stars spread across 500 distant galaxies. The astronomers were hunting for signs of massive stellar death explosions known as supernovae. The researchers describe their results in a paper accepted for publication in the Astrophysical Journal. In 2011, two massive stars, called red supergiants, exploded while in Kepler's view. The first behemoth, KSN 2011a, is nearly 300 times the size of our sun and 700 million light years from Earth. The second, KSN 2011d, is roughly 500 times the size of our sun and about 1.2 billion light years away. "To put their size into perspective, Earth's orbit about our sun would fit comfortably within these colossal stars," said Peter Garnavich, an astrophysics professor at the University of Notre Dame in Indiana who led the analysis efforts. Whether it's a plane crash, car wreck or supernova, capturing images of sudden, catastrophic events is extremely difficult but tremendously helpful for understanding the event's root cause. The steady gaze of Kepler allowed astronomers to see, at last, a supernova shock wave as it reached the surface of a star. 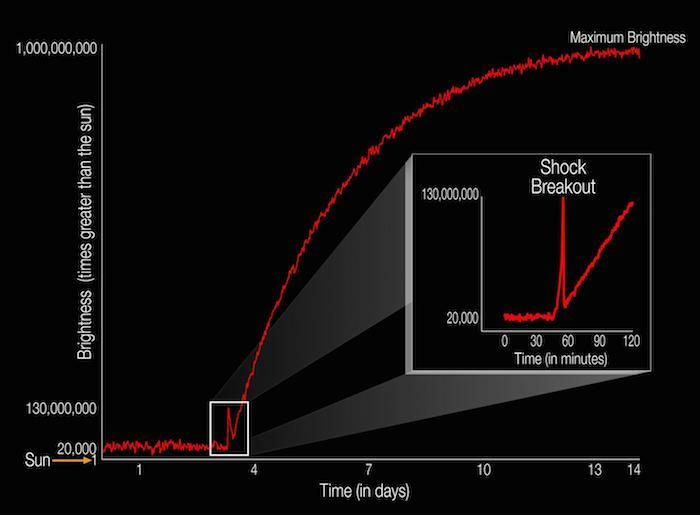 Catching this flash of energy is an investigative milestone for astronomers, because the shock breakout only lasts about 20 minutes. "Like police getting surveillance footage of a crime after the event, we can study brightness histories from Kepler to find out what was happening in the exact hour that the shock wave from the stellar core reached the surface of the star," said Edward Shaya, an associate research scientist in astronomy at UMD and a co-author on the study. "These events are bright enough that they change the brightness of the whole galaxy by a measurable amount." Supernovae like these--known as Type II--begin when the internal furnace of a star runs out of nuclear fuel, causing its core to collapse as gravity takes over. The two supernovae matched up well with mathematical models of Type II explosions, thus reinforcing some existing theories. But the supernovae also revealed an unexpected variety in these cataclysmic stellar events. While both explosions delivered a similar energetic punch, no shock breakout was seen in the smaller of the two supergiants. Scientists think this is likely due to the smaller star being surrounded by gas--perhaps enough to mask the shock wave when it reached the star's surface. "That is the puzzle of these results," said Garnavich. "You look at two supernovae and see two different things. That's maximum diversity." Studying the physics of these violent events allows scientists to better understand how the seeds of chemical complexity and life itself have been scattered in space and time in our Milky Way galaxy. "All heavy elements in the universe come from supernova explosions. For example, all the silver, nickel, and copper in the earth and even in our bodies came from the explosive death throes of stars," said Steve Howell, project scientist for NASA's Kepler and K2 missions at NASA's Ames Research Center in California's Silicon Valley. "Life exists because of supernovae." Garnavich, Shaya and their co-authors are part of a research team known as the Kepler Extragalactic Survey (KEGS). The team is nearly finished mining data from Kepler's primary mission, which ended in 2013. However, with the reboot of the Kepler spacecraft as NASA's K2 mission, the team is now hunting for supernova events in other distant galaxies. "It is a thrill to be a part of theoretical predictions becoming an observed and tested phenomenon," Shaya said. "We now have more than just theory to explain what happens when a supernova shock wave reaches the surface of a star as that star is totally torn apart." In addition to Garnavich and Shaya, the KEGS team also includes Robert Olling, a visiting assistant research scientist in astronomy at UMD, as well as researchers from the Australian National University in Canberra, Australia; the Space Telescope Science Institute in Baltimore, Maryland; and the University of California, Berkeley. The research paper, "Shock Breakout and Early Light Curves of Type II-P Supernovae Observed with Kepler," has been accepted for publication in the Astrophysical Journal. This work was partly supported by NASA (Award Nos. NNX12AC89G and NNX11AG95G.) The content of this article does not necessarily reflect the views of this organization.